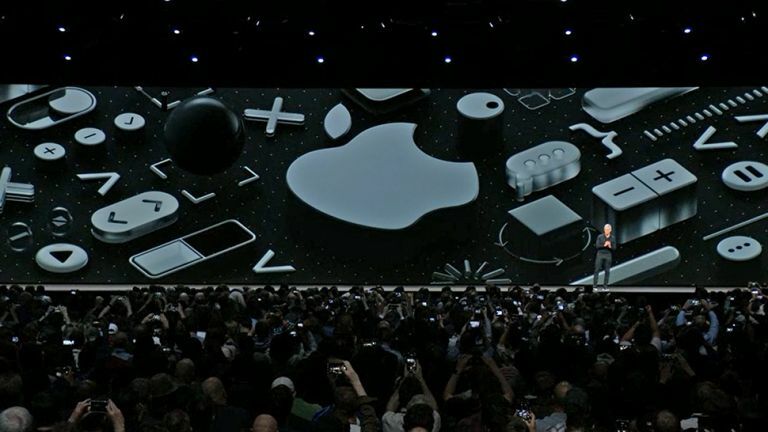 Well it was another packed Worldwide Developers Conference keynote from Apple this year, covering some pretty major updates and tweaks to iOS, macOS, watchOS and tvOS. Here we'll run down everything unveiled in San Jose that's coming your way this year. Beta software is available now for developers, so you must be a registered, paid-up app maker to qualify. Everyone else can get involved with some early previews further down the line – we don't have exact dates yet, but expect public betas sometime towards July. Apple had plenty of iOS 12 updates to talk about today, so we'll just dive right in: first of all every device that can run iOS 11 will also run iOS 12, and Apple boasted about some fairly significant performance increases too. How does a 40 percent increase in app loading times on the iPhone 6 sound? As expected, the augmented reality capabilities of iOS got an upgrade. You'll now be able to share AR experiences with other people, and there's a brand new AR file format to help developers build better apps. Apple even showed off a cool new app called Measure – a measuring tape that works in augmented reality. Apple also introduced two improvements we've waited a long time for – grouped notifications that are less likely to clog up your screen, and Group FaceTime that lets you chat with up to 32 people at once on the same video call. If you've got that many friends then more power to you. Siri gets smarter with more intelligent suggestions about what you might want to look for or do next, and with a new app developer tool called Siri Shortcuts it can get its hooks deeper into third-party apps – so you can just say "I lost my keys" to start a search for a Tile tag through the Tile app, for example. As with Android P, iOS 12 is going to feature new user-facing tools to track your app and phone usage, so you can set yourself (or your kids) some screen time limits. Apple will even warn you when you've been spending too much time messing about on social media, if you want it to. There's a new Do Not Disturb mode especially for bedtime too, which dims the lock screen and hides notifications until morning. The Photos app is getting smarter, with personalised suggestions and automatic sharing prompts, based on the people in your photos. There are minor tweaks to Apple News, Stocks, Voice Memos and CarPlay too – CarPlay can now run third-party mapping apps like Waze or Google Maps, for instance. Finally for iOS 12, messaging is getting an upgrade with more Animoji, more realistic Animoji, and cartoon caricatures of your own face called Memoji (which work a lot like the Bitmoji you can get in Snapchat). Apple seems keen to add as many filters and AR objects as possible into its mobile OS, and who are we to argue? All in all, there was an impressive roster of new features demoed in iOS 12, and we're looking forward to trying them out. Before the show the rumours had been that the software update would focus on stability and bug fixing, but there are still enough new features here to keep us happy. And so to the desktop software, which we now know is called Mojave. As predicted, macOS 10.14 is going to feature a system-wide dark mode that improves on the current dark mode by extending to more interface elements and first-party apps. Third-party developers can implement it in their own apps too. We've also got Dynamic Desktops, which are basically live wallpapers for macOS. macOS is borrowing from iOS in terms of letting you mark up screenshots after you've grabbed them, and it turns out the rumours about iOS apps coming to macOS were half right too – News, Stocks, Voice Memos and Home are making the jump, and Apple says it hopes to bring more mobile apps to the desktop next year. Speaking of apps, the Mac App Store is getting a much-needed facelift too. Security is being tightened, with better user control over app permissions, and even more options for shutting down cookies in Safari that try and track you across multiple websites. This is something Apple started to introduce last year, and it looks like the company is keen to to upgrade the security and privacy tools within its apps even further. There's a new feature called Stacks, which (as the name suggests) stacks similar files together on the desktop, in theory leading to less clutter. Speaking of easier navigation, we've also got a new Gallery View in Finder, and a detailed metadata display in the Preview pane. Thanks to the introduction of "Quick Actions", meanwhile, you can perform basic tasks on files without opening up another app. As you might have expected, fitness was a big focus for the watchOS 5 update, and Apple even had an exercise bike out on stage to help with some of the demos. You can get competitive with other Apple Watch wearers and challenge them to beat your scores, you can take advantage of new activities like Yoga and Hiking on the app, and you can enjoy automatic workout tracking for a lot of popular workouts. We also like the look of the cool new Walkie Talkie app that turns your Apple Watch into... well... a walkie talkie. You can blast messages to approved contacts over Wi-Fi or cellular connections, no phones required. Watch notifications are getting clearer and easier to interact with, Apple says, and you can now open links in a mini web browser if needed. The Podcasts app is coming to the Apple Watch at last, while audio apps like Podcasts can now keep playing sound in the background while you do other stuff on your wrist. Offline playback is now possible too, for those times you don't have a strong cellular or Wi-Fi connection. As on iOS, Siri is getting smarter, with more helpful prompts about what you might want to do next, and the same Siri Shortcuts as you get on the iPhone – links into particular apps so you can jump straight to particular tasks with a Siri command. With watchOS 5, you don't even have to say "hey Siri" any more, because just lifting up your wrist towards your face will be enough to activate the listening feature. Unfortunately we didn't get the third-party watch face store we were hoping for, but you can't have everything. Apple did introduce a new Pride watch face to go with the Pride watch band, and you can download that from today. Apple didn't have as much to say about tvOS 12 as it did about its other software packages, but there are still some upgrades to talk about: for example, the Apple TV 4K is now getting Dolby Atmos support, making it the only set-top box that's certified for Dolby Vision visuals and Dolby Atmos audio. Any iTunes content that you've already purchased will get a free Dolby Atmos upgrade, where available, so you might want to start saving up for a more expensive set of speakers. If you want to know more about these technologies and the difference they can make, then we've got a full guide right here. There's good news for remote control fans, as Apple is opening up the Apple TV to third-party remote makers, and other manufacturers will even be able to include Siri support in their devices. What's more, the iOS Control Centre is getting a dedicated Apple TV control tile so you can easily operate your Apple set-top box from your Apple phone. That's just about all there was to talk about for tvOS 12 – it didn't get the same number of upgrades as the other operating systems. Oh, there is a brand new aerial screensaver on the way though, with footage taken from the International Space Station, and it sounds well worth checking out.